Green-winged Macaw (also known as the Red-and-green Macaw) at Jurong BirdPark, Singapore. The Green Winged Macaw, scientific name Ara Chloroptera, is also commonly known as the Maroon Macaw or Red and Green Macaw. They are second only in size to the Hyacinth Macaw. The Green Wing is often confused with the Scarlet because of all the red coloring but can easily be told apart by looking at their backs. The Green Wing has a green band of color while the Scarlet has a yellow band of color across its back. The Green Wing is one of the most colorful Macaws, bright red is the dominant color while the feathers near the body are dark red and turn green in the middle of the wing and the tips are lined in a bluish color. The tail is also a dark red with bluish tips. Their feet are dark grey and the iris is a pale yellow. These birds are between 25-36 inches long head to tail and have a soaring span of up to 49 inches. The Lovable Green Wing can tip the scale at over 1800 grams and have extremely powerful beaks. The natural habitat of the green wing is Central and South America, running from eastern Panama south across northern South America, east of the Andes to Brazil, Paraguay, and Bolivia. They can be found in the rainforests and at clay cliffs running along the river banks. However, because of deforestation and the illegal pet trade, the Green Wing Macaw has been put on the endangered species list. It will probably only be through captive breeding that this lovable bird stays off the extinct species list. Their main source of food is a speckled sunflower, high in protein. They also consume white sunflower, shelled oats, corn seed, peanuts, pine nuts, hemp, and buckwheat. You can supplement their diet with tropical fruit, vegetables, and various nuts. The Green Wing is a social bird and flock animal while they mate for life, in the wild these birds can travel in family groups of up to 100 birds. Even in such large flocks, mates will stick close to each other. These Macaws are naturally active and spend many hours a day flying, playing and eating. In captivity, these birds still require a lot of activity and must be given ample playtime. These birds are very lovable, intelligent, and inquisitive. This makes them great companions for a single person or a whole family if the bird is socialized properly. However, being inquisitive has its drawbacks. These birds see everything in their environment as their toys or food; therefore they can chew on electric cords or tear up those cherished keepsakes, so keep this in mind when you let them out for fun and exercise. Also, because they are so intelligent they sense our mood and often get in that same mood too; i.e., if you are angry they get angry if you are happy they are happy. Remember, approach your bird as a friend and family member and enjoy a happy and lifelong companionship with your lovable giant, the Green Wing Macaw. You love your kid or kids and the reasons for it just cannot be counted. I love my daughter more than anything but my Blue and Gold Macaw runs a close second. I sometimes wonder knowing what I know now. Would I do things the same way? If I had a do over. So one day shortly after sending my daughter off to Florida State University to finish her last two years. I sat down and thought about things from a different perspective and listed the below. 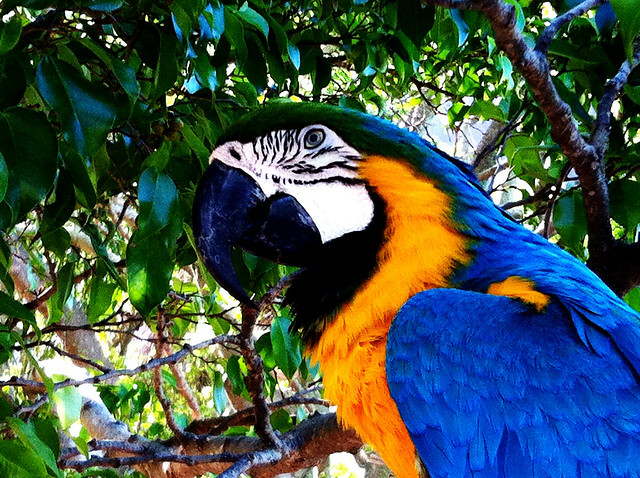 Here are 50 reasons why I believe owning a Blue and Gold Macaw may be a better choice than having a child. 1. Color coordination, they have it down pat. No one does it better than a Blue and Gold Macaw. 2. There is no P.T.A. 3. A Macaw doesn't want to go to the movies. When and wherever I want to go so goes my Blue And Gold Macaw. 4. A Macaw gives you the remote. He doesn't care whats on the tube tonight. 5. Your Macaw likes you, mostly. 6. A Macaw doesn't lie to you. 7. A Macaw actually misses you when you're gone. 8. Just because it's Christmas a Macaw won't wake you up any earlier than normal. 9. A Macaw doesn't expect a Christmas gift. 10. A Macaw doesn't know its his birthday and won't remind you of it everyday for a month. 11. You don't need to take a Macaw to school. You get to be the school. 12. A Macaw doesn't expect a car for their 18th birthday or ever. 13. No need to save for a Macaws college fund. 14. A Macaw washes and dries his own clothes. 15. A Macaw will shower with you. 16. Macaws are cheaper than kids. 17. Macaws are generally friendlier than kids. 18. Its easier to understand a Macaw than a kid. 19.Macaws don't need a night light. 20. A Macaw doesn't want a cell phone or Ipod. 21. A Macaw doesn't need a computer or Playstation. 22. A Macaw will at least try to eat a vegetable. 23. You never need to help a Blue and Gold Macaw with homework. 24. You never need to meet with a Macaws principal. 25. A Macaw will never annoy you with a text message. 26. A Macaw never expects you to text them back. 27. You get to choose where your Macaw makes his messes. 28. A Macaw doesn't invite the Macaw down the street for dinner. 29. Macaws don't get into slumber parties. 30. A Macaw enjoys speaking with you. Even if its only a few words. 31. Macaws are not difficult to cook for. 32. Macaw toys are cheaper. But may not last longer. 33. Macaws don't care what the bird down the street has or gets. 34. You can train a Macaw. Or your Macaw can train you. Depends on your outlook. 35. A Macaw doesn't pout every time he doesn't get his way. 36. Macaws make excellent nut crackers. 37. A Macaw will find your jewelery fascinating. 38. If you're doing something a Macaw will be curious as to what it is. 39. A Macaw will never ask to stay over somewhere else. 40. Even if it isn't his Birthday or Christmas morning. My Blue And Gold Macaw still likes me. 41. Friends or family that must have quiet won't visit you often or for long. 42. You just cannot cramp a Blue and Gold Macaws style, he just won't let you. 43. Macaws don't care if they've had broccoli once already this week. 44. Macaws don't play soccer. 45. Macaws know who the boss is in the family and they don't care. 46. Macaws don't need braces on their teeth. 47. Macaws won't die if they don't have a new pair of Nike's. 48. Macaws don't need a prom dress. 49. You don't need to give a Macaw away because it met another bird. 50. Blue and Gold Macaws never outgrow their clothes. I have had my Blue and Gold Macaw (Shadow) 12 years longer than the 19 year old daughter. Over those years I have never had heartbreak nor frustration from Shadow. He is just a Blue and Gold Macaw and I know this. It is all I ever expect from him. I wish the daughter had been so easy. Green-winged Macaw or Red-and-green Macaw (Ara chloropterus) at Gatorland. Macaw is a large tropical American parrot with a long tail harsh voice and brilliant plumage. Macaws are really beautiful all of there kind but I'll focus and give consideration to one kind of macaws. Green wing macaw is a beautiful giant bird that originates from South America. It comes from the genus Ara. Its scientific name is Ara Chloroptera which means ara for strong, chloro for green and ptera for wing. Its name speaks for itself but actually there wing has a striking blend of red with green and blue stripes. They were often confused with other macaws but still, it has its own uniqueness. A patch that is transverse with red feathers which looks like Indian war paint. Is it ideal for us to take green wing macaw as a pet in our home? Yes, but it will be difficult because what I've said earlier it is a giant bird so it needed a large cage. Green wing macaw measures about 26-36 inches so it is approximately 2 1/2 to 3 feet and weighs 1250-1700g or 1.25-1.7kg. When choosing a cage for them for me I think a stainless cage would be better than the powder coated. The powder coating may not last under the green wing macaw's beak and maybe the powder coating might poison them and might cause harm. Green wing macaw is bought nowadays to be a pet. They interact socially with people and other macaws even though they don't speak much. A lot of people were funned of them but some misinterpret their appearance because it is some kind of a majestic. They fail to appreciate the extreme intelligent nature of the beautiful macaw. It has been slow to breed in captivity from wild caught stock. It eventually improved with captive bred bird serves as the breeder. Their reproductive maturity is 4-5 years. Their lifespan is quite long it will last for about 60-80 years and even greater. So you will be buddy forever, and you will grow up together. More and more people consider owning a Blue And Gold Macaw The truth is only a very few should actually do it. Simply pay attention to the numbers of Macaws being sold by private owners. Far to often people simply bite off far more than they can chew or don't understand the amount of time, dedication, work, commitment involved with owning a Macaw parrot. It is likely the beauty, the out of this world colors, the affectionate/playful natures and overall intelligence of Macaw parrots that make these birds nearly irresistible for animal lovers. To many people unfortunately, buy on impulse when they buy one of these magnificent birds. Buying a Macaw is to often based on a delightful casual introduction and not any appreciable amount of before purchase research. Properly trained, loving and intelligent Macaws are not something that just happens. That bird is the product of love, care, devotion, understanding, and work. For those who own and love the Macaws, it may be the most gratifying work but it works none the less. The work begins with reputable dedicated breeders hand feeding and socializing the chicks. After purchase that socialization must be a continuing process. Breeder commitment and dedication is the reason that hand fed babies make the best companions. By hand feeding the babies, the breeders instill humans as essential to the babies existence and as a natural and normal part of his flock. This makes humans a recognizable part of the birds family. It takes a real expert to tame a Macaw Blue And Gold or other that is not a hand fed chick. Most of those will just never become as loving, gentle and happy to be a part of the family as will the hand fed a bird. The first step in socializing any large companion bird is hand feeding the chicks. Personal attention by the breeders goes a very long way, helping to ensure anyone willing to continue the process will likely continue to have a good natured, trainable and loving bird. Unfortunately most or too many prospective owners do not fully grasp the importance of continuing the socialization process initiated by the breeder. So having a great deal of time and even more, desire to continue the process is mandatory before anyone should buy a Macaw. 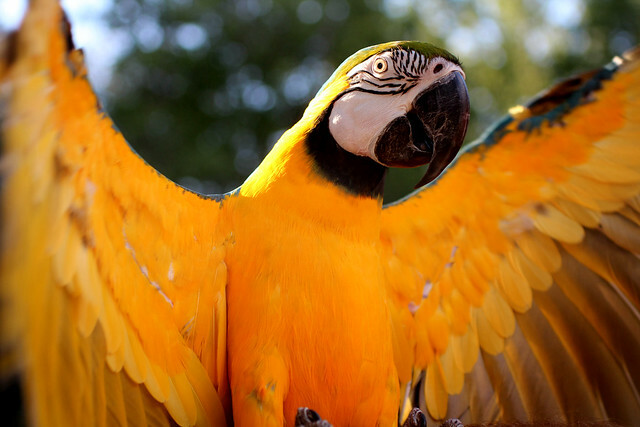 With large birds like the Blue And Gold Macaw, the socialization process must be ongoing for life. Left alone to fend on their own Macaws can easily revert. They may become far wilder than a loving, gentle companion. Left alone too long and or too often the Macaw can easily lose any interest in being that lovable bird and companion you first purchased. He can become that feather plucking, aggressive, extraordinarily loud and destructive bird he is quite capable of becoming. Done correctly owning a Macaw parrot is every bit as gratifying as owning any other pet, for me it is more. I can think of no other pet that will bond closer or for as long as the Macaw or other large parrots. For me and maybe because Macaws are not domesticated animals bonding is of a more personal nature. Perhaps it is the sole fact that the Macaws are not domesticated that makes bonding so very remarkable and heartfelt. The Blue And Gold Macaw is not for the casual pet owner. If lacking the time, dedication and commitment to supplying his needs the Macaw is not a good choice. The Blue And Gold Macaw almost demands you spend your time and that you provide him not just physical care but emotional support also. He can be almost maniacal in his need of your attentions but can be just as maniacal when it comes to showing and giving his affection to those within his flock. Primarily due to his loving and friendly nature. It's seldom that a Blue And Gold Macaw will prefer to be left alone. A well socialized Macaw will want to be included in everything you do. Most of the time A Blue And Gold Macaw simply wants to be with you helping to do whatever you're doing. He can't help it. It's his nature. Without a doubt, it is your time, your caring, your devotion and understanding that allow a Macaw to become such an amazing companion. He easily becomes just another beautiful bird without your commitment. Because owning a Macaw means giving so much of yourself. It is unlikely to ever duplicate the experience with any other type of animal. Life with a Macaw becomes intensely personal and gratifying. The bonus is. The experience can last your lifetime. Ryleigh Cantrell has owned his Blue And Gold Macaw (Shadow) since 1978. There are two guesses as to the birds' name.The two are inseparable. Also called blue and yellow sometimes, are about 34 to 36 inches in length. The beak and feet are black, naked white check patches, that become rosy at times, because they can blush, and even feel warmer in the face at that time. They have black feather lines on the bare white skin, that is bordered with more black feathers around the chin, as a young macaw matures these chin feathers descend future down making a much wider band. Green-winged Macaw (Ara chloropterus) on right. At Jurong Bird Park, Singapore. The eyes also lighten with age from dark to gray and then to a whitish yellow. Forehead is green and runs into the rich turquoise blue (some almost look cobalt blue) of the head, down the back, wing tops, and top side of tail. With a rich yellow almost orange gold on some, running down under the chin, chest, and undersides of wings, tail, under covert same but laced with blue. One thing unique to the Blue and Gold is the scent they can give off at will (smells like fresh sun shine and light cologne) if you have a Blue and Gold than you know what I'm talking about. Anyone else would think you're making it up, Diane from Country Boy Cages once said she wished she could bottle that scent. They talk exceptionally well, often before being weaned. Macaws often make up there own phrases from what they have heard. We are always telling our dogs to get off the porch, and of course the macaws say it too! Even getting which name goes with the right dog (pretty smart) "Turkey" (my pet macaw) will say a persons name that she knows in place of the dogs name, like: "Lisa get off the porch" followed by a hardy laugh, because she knows she made it up herself and it's funny. Be careful what you say in front of them, don't assume if your not talking to them directly that they don't hear it, only to repeat it some where down the road when you least expect it. A friend and I attended quite a few Fairs where someone had taught a young Blue and Gold Macaw to sing "Jingle Bells", around the holiday's it was just precious, after months of this until the bird was sold it sang "Jingle Bells". Please make sure what you teach your bird is something you would want to hear just in case it turns out to be the favored phrase or song. Our Macaws not only talk but will also say it in the very voice of person they learned it from, my friend will often think he is being called by me only to find out it's one of the Macaws or Cockatoos. Our dogs when in the back yard will seldom come when we call them, because the Macaws just wear them out calling them by name, getting them to go back and forth all day. Macaws are intelligent and very social creatures they can be quite LOUD at times, and quite demanding, but I couldn't imagine life without them. If your thinking of getting a Macaw to match your living room, as a novelty, colorful display, or just because they talk, than you are getting one for all the wrong reasons. Put as much planning into getting a Macaw as you would if you were planning for a child. Actually that is how you should plan for any bird or pet for that matter. Often people get a pet and let it have free range in the house, this is not good because what starts out cute or funny often does not stay that way because you are letting the bird make it's own fun, set boundaries, a well behaved pet is much more enjoyable to be around. My macaws when in my house are not destructive, but will tear up their own stuff, and they do know what NO means. Would you give a child a handful of colors in a room by him or herself with no guidance other than letting them know they are free to do what ever, and do you really expect them not to color those walls? And should you have the right to be mad? Or would you give the child an area in which they have guidance to express them self's freely, that would be acceptable for them to color? Well, do the same for your bird. Never hit your bird, this breaks the trust, besides there bones are more delicate being hollow making them lighter for flight. You are your pet birds flock, you are his or her family, you are the caretaker of his world please make it safe for your pet. A Blue and Gold Macaw requires a large strong cage, no smaller than 2ft deep x 3ft wide x 3ft to 4ft high depending if it's on legs and or casters. Larger is always better when it comes to Macaws. This is where he will spend a lot of time when he can't be out and about with you, or supervised by you or a responsible person in your family. I have always recommended more than one cage for most birds. The reason being you can have an indoor and an outdoor cage for your Macaw, allowing him to experience the great outdoors or just plain breaking the mundane monotony of seeing the same thing day in and day out. My Macaws enjoy the family barbecue just not to close to the smoke and or flames, and yes when it cools they share in the feast. Remember he doesn't go to school, he doesn't go to work, he doesn't get to shop, he doesn't get to choose what he'd like out of the frig, but depends on you for everything. If you've had a bad day you can't expect him to not be excited the moment you return home (he wants to be with the people he loves) so with a second cage you can give him new scenery to unwind from the day and you'll have the space you need to chill out kick off your shoes and enjoy his company later. After he's gotten loud out side over your return and the things he gets to see out side, he'll be much calmer and more enjoyable after that head ache The Blue & Gold Macaw is almost never a finicky eater if new foods have been offered, but he should have a base diet of seed, nuts, fresh fruit, and veggies, I cook most veggies into a corn bread that I serve daily. And I always cook corn on the cob because that inhibits that dreadfully toxic mold that usually begins undetected by the naked eye on raw corn and then has already reached the deadly stage when you can see it. Besides the fact that a cooked properly dried out corn cob makes for a great toy. In addition our birds like lean cooked meat (let me rephrase that by saying we give them lean cooked meat, because if they could get that fatty hamburger they'd go for it) and they do love the marrow from bones, including chicken! Mine love sea food and fresh fish, cooked of course. It has been noted in the wild when water levels drop and pools of water get smaller trapping fish and other crustaceans often you will see Macaws, sometimes even an entire flock, devouring the left behind goodies. My friend (from Peru) says my Macaws are big blue buzzards comes to food, and she has seen Macaws in the wild eating road kill. How dare her say that about my birds whom often share snacks with me, although I have caught them after the dogs food and or bones as well as the cat food, "Turkey" even says "um good" when she sees something she likes to eat. Always change the water at least daily more often is so much better, especially because Macaws like to soak and wash their food in the water. Toys are important to all birds from finches to Macaws, it gives them activities that are healthy for a happier more content pet, this is so necessary for their well-being. Macaws need to chew as most birds do, for one it wears down the beak, and they just plan like doing it. We provide ours with blocks of clean soft wood, in addition I use wooden perches not PVC, because I want them to enjoy it and not eat my furniture or remote control for the TV, and I give them spinach leaves to eat and tear up so they leave my house plants alone. It is an old wives tale to believe your bird knows what is good for it, you must keep your pet from unhealthy, harmful, toxic, and life threatening things and or situations. The Blue and Gold Macaws never fail to amuse or entertain, even though they are as all pets that are properly taken care of high maintenance. Gentle Giants as those of us that have them and know them well, big beak and even bigger heart! Majestic, magnificent, colorful, and just down right amazing creatures in their own right. Lisa Sweet has been breeding birds and working with animals for over 25 years. She has worked for a veterinarian and is still working towards more informed pet owners, so our feathered friends can be cared for just a little bit better. Please visit our website: http://www.sweetacrebirdfarm.com it is a website with a great wealth of information for anyone wanting to learn about exotic birds.